Stag Designs: Remotes Under Control! 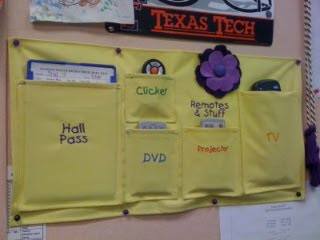 As a teacher, I have remotes for many, many things: projector, slide advancer, DVD player, TV, etc. They used to be in my desk drawer, floating around with sharpies, bandaids and other necessities. One day, I couldn't take it anymore. I threw together this 'Remote Holder' and I think it's pretty fabulous!! I didn't do much measuring...just layed each object down to make sure the pocket was big enough. I think it turned out pretty well for an hour of work! Great organizational tip! I love organization! I hope you will stop by my "Party in Paris" on friday.